Last year, the US Department of Energy announced that the SunShot Initiative successfully met its 2020 utility-scale solar cost target of $0.06 per kilowatt hour three years earlier than expected. This milestone marks a huge step forward for the industry as it moves toward a greener future that’s less reliant on fossil fuels. While 6 cents may sound cheap, it’s far from the bottom. The SunShot Initiative is now working towards another lofty goal for 2030: $0.03 per KwH. This benchmark would make solar energy one of the least expensive options for new power generation, and help drive mass adoption on a national scale. Hardware Advancements Have Driven Down Costs. Until Now. Solar energy has seen a good run over the last decade. Costs have come down almost 90%. Meanwhile, adoption has skyrocketed thanks to the lower prices. The reduction of utility-scale solar energy costs have come down considerably since 2009. Source: Lazard. To date, these cost reductions have mostly been driven by hardware advancements in solar modules, inverters, and other electrical components. While this has been a boon for the industry, it’s left little room for further efficiency to be gleaned in the near term from additional advancements to PV system hardware. Installed PV System Prices over time. Source: SunShot Initiative. Which brings us to software. We believe the next wave of innovation will come in the form of smarter, more efficient workflows powered by software and actionable data. Drone software to be precise. As the old adage goes, “work smarter, not harder,” which drone software enables through faster data collection, analysis, and reporting. Drones offer the same benefits to solar as other mainstream industry adopters, like construction, where drones have already been proven. And they are already shaking up solar design, installation, and inspection workflows in a big way. The rising costs of construction, operations, and maintenance eat away at margins. And without significant hardware advancements to pad the bottom line, companies need to find ways to reduce costs at this stage in the industry’s growth. Drones (paired with powerful software like DroneDeploy) can help. How exactly? By making workers more productive and lowering labor costs and safety risk along the way. 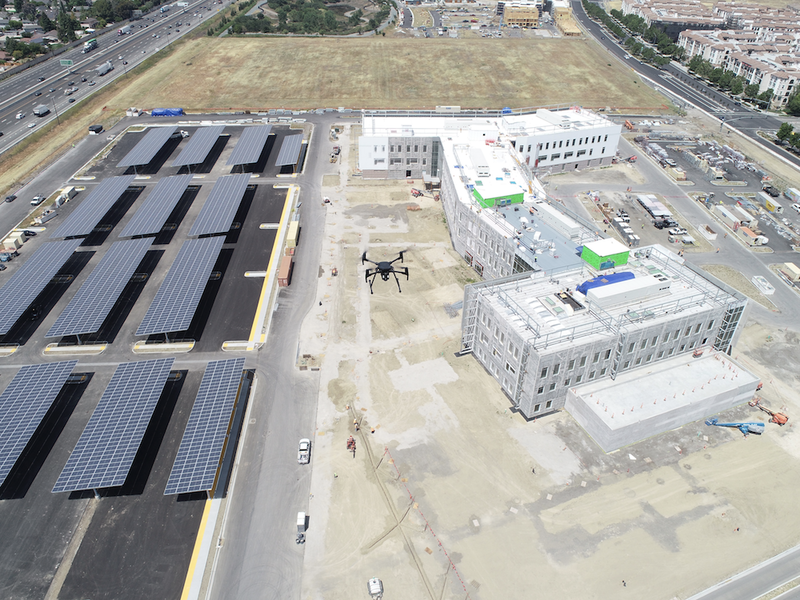 For the solar surveyor measuring roofs before panel layouts get designed and installed, drones eliminate the need to scale rooftops and take manual measurements. The best part? It can take as little as 20 minutes to map a site, collect accurate data, and begin processing a drone map in the cloud. This results in a 3X boost in productivity and less time spent in the field. And the buck doesn’t stop there. Designers, installers, and inspectors also save time by putting drones to work. With Thermal Live Map, a solar farm can be inspected from the sky. Photo courtesy of DJI. As solar sites become more distributed, increasingly remote, and reach a larger scale, the cost-saving effect of drones will only be amplified. Consider the distributed nature of solar projects and the challenges operators face to keep them running at maximum capacity. Drones can access difficult to reach places and spot broken solar cells in minutes — instead of hours or days — and increase the efficiency of maintenance crews. The latest software powered by edge computing, machine learning, and API tools eliminate the complexity of inspecting, repairing, and reporting issues on solar farms. Not to mention that drones improve worker safety by keeping boots on the ground and out of the sun for long periods of time. 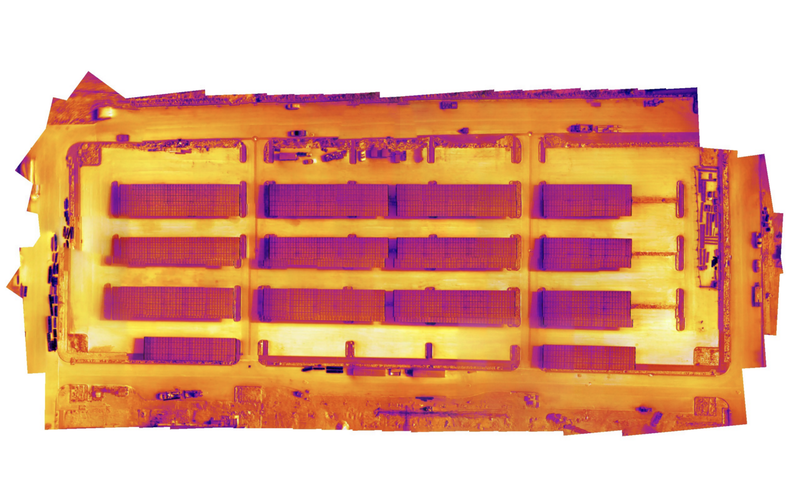 Real-time thermal drone maps help spot broken cells in minutes, drastically reducing inspection and maintenance cycles for solar operators. By shortening the inspection and maintenance cycles, solar operators can reduce downtime and ensure solar farms run at peak efficiency. Put simply, this means more energy is produced at a lower cost to both the operator and the consumer. Which is precisely the goal of the SunShot program. 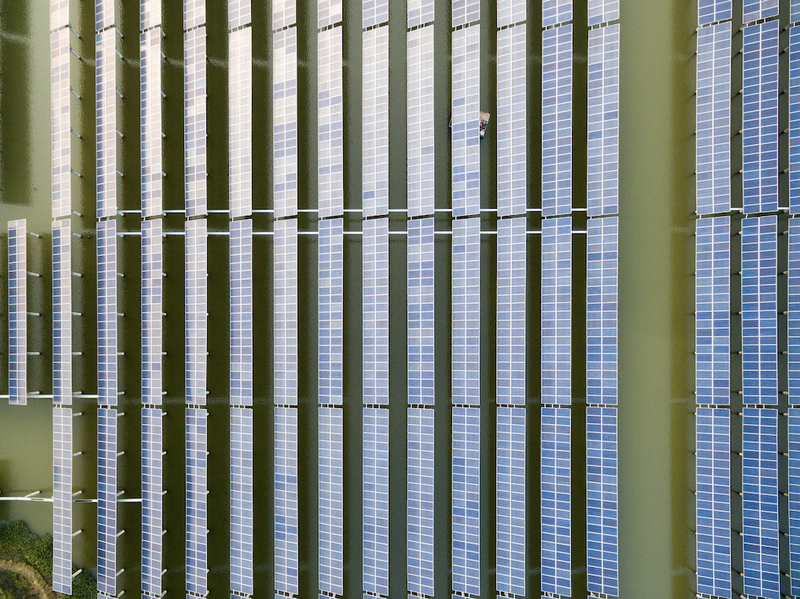 We think the future of solar energy in the US is bright. And as drone use continues to increase in the solar industry, so too does the potential that solar power will become a primary source of all electricity in the United States. By reducing the total cost of solar power production and achieving the long sought after $0.03 KwH, we will see solar energy take over within our lifetime.